I know all of you are keeping cool in the shade during the sun’s strongest hours (between 10 a.m. and 4 p.m.), or you’re wearing a great natural sunscreen to protect yourself from frying. 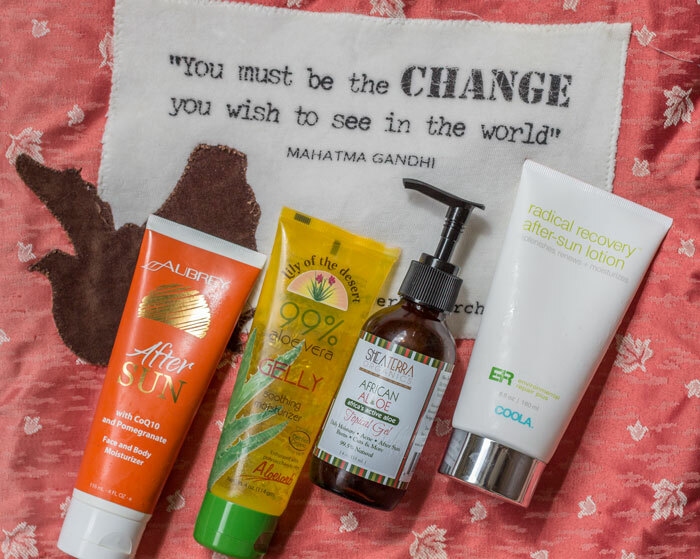 For those of us who still manage to get a bit burnt (ahem, me on the Fourth of July), there’s plenty of great natural after-sun lotions and gels to help our skin cool down and heal a bit faster. Here’s the four I keep stashed in my fridge. Aubrey’s After Sun with CoQ10 and Pomegranate is a medium-texture lotion loaded with CoQ10 to support collagen post-sun exposure. Organic pomegranate provides a shot of healing antioxidants while baobab oil softens the skin. It dries quickly and leaves a faint floral-fruit scent. Lily of the Desert’s Aloe Gelly is a simple aloe vera after-sun treatment that simply works. The cool gel feels amazing on warm skin and doesn’t get sticky like some aloe vera after-sun treatments. If you’re avoiding phenoxyethanol in your skincare, though, you’ll need to pass on this one. Organic aloe vera barbadensis leaf juice (gel), carbomer (thickener), certified organic aloe vera juice (gel) concentrate, organic aloe vera barbadensis leaf polysaccharides (aloesorb™), tocopheryl acetate (vitamin E), retinyl palmitate (vitamin A), ascorbic acid (vitamin C), disodium EDTA (preservative), caprylyl glycol (emollient), phenoxyethanol (preservative), sorbic acid (preservative). A cleaner (and more expensive) option than the Lily of the Desert aloe vera mentioned above, Shea Terra Organics’ African Aloe Topical Gel is housed in a neat pump jar made of protective amber-colored glass. Shea Terra says this aloe, sourced from the Cape of South Africa, is known to be the most active aloe in the world, meaning its healing properties are more rapid and intense. Shea Terra Organics African Aloe Topical Gel has that traditional slippery feel to it and is dense enough that it takes just a little to treat the affected areas. If I had to choose one to repurchase from this collection, it would be this one! With its impressive ingredients list, including agave, aloe vera, lavender oil, rosemary extract and sunflower oil, COOLA’s Environmental Repair Plus Radical Recovery After-Sun Lotion does a thorough job of soothing and moisturizing skin. The thoughtful addition of agave ensures proper hydration and collagen synthesis in addition to sunburn relief. Old pal aloe vera keeps moisture packed into the skin while lavender and rosemary calm and renew (not to mention make this natural after-sun lotion smell incredible!). Water/aqua/eau, Helianthus Annuus (Sunflower) Seed Oil*, Aloe Barbadensis (Aloe Vera) Leaf Juice*, Cetearyl Alcohol, Glycerin, Caprylic/capric Triglyceride, Cetearyl Glucoside, Saccharomyces/agave Americana Leaf Ferment Filtrate*, Cetyl Palmitate, Lavandula Angustifolia (Lavender) Flower Oil*, Citrus Sinensis (Sweet Orange) Peel Oil, Citrus Reticulata (Mandarin Red) Peel Oil, Rosmarinus Officinalis (Rosemary) Leaf Oil, Cedrus Atlantica (Cedar) Wood Oil, Xanthan Gum, Rosmarinus Officinalis (Rosemary) Leaf Extract*, Dehydroacetic Acid, Benzyl Alcohol. What natural after-sun treatments have you been using? Have you tried any of these? Tell me in the comments section!